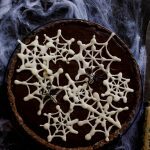 This salted caramel macadamia chocolate tart is absolutely drool-worthy and is perfect for Halloween when served with white chocolate spiderwebs. This post is sponsored by BBC Lifestyle. All opinions are my own. It’s almost Halloween and if you are still looking for a sweet treat with a spooky edge, you’ve found it. 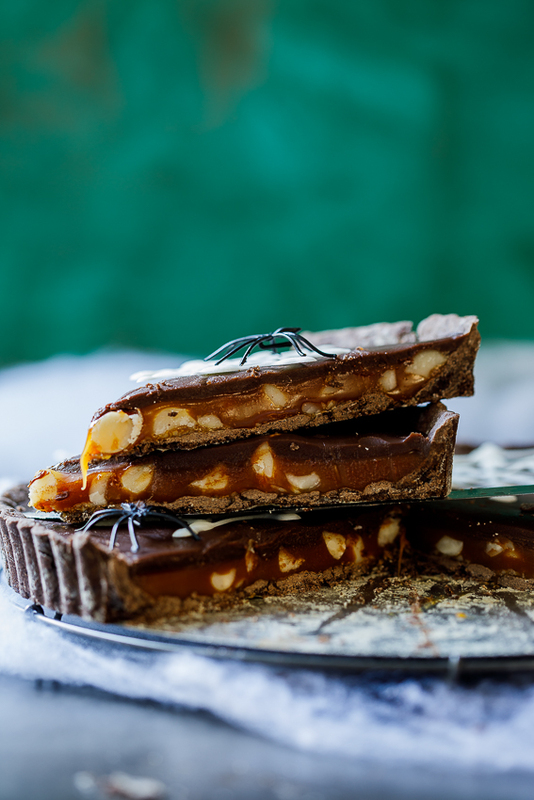 This tart is all kinds of delicious with a layer of salted caramel studded with macadamias topped with the smoothest chocolate ganache. It’s the kind of dessert that will have your guests begging for seconds. 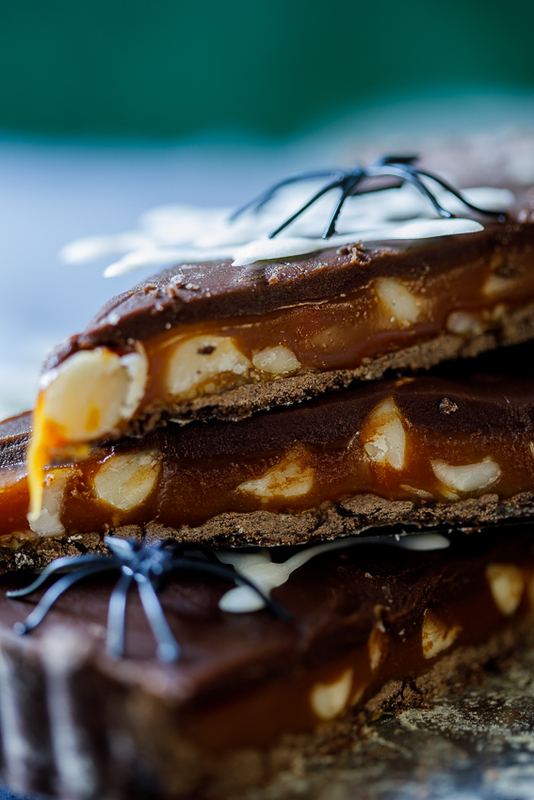 When BBC Lifestyle asked me to put a Halloween-spin on one of the many desserts created by the contestants of The Great South African Bake Off, I knew this salted caramel chocolate beauty would be the one. 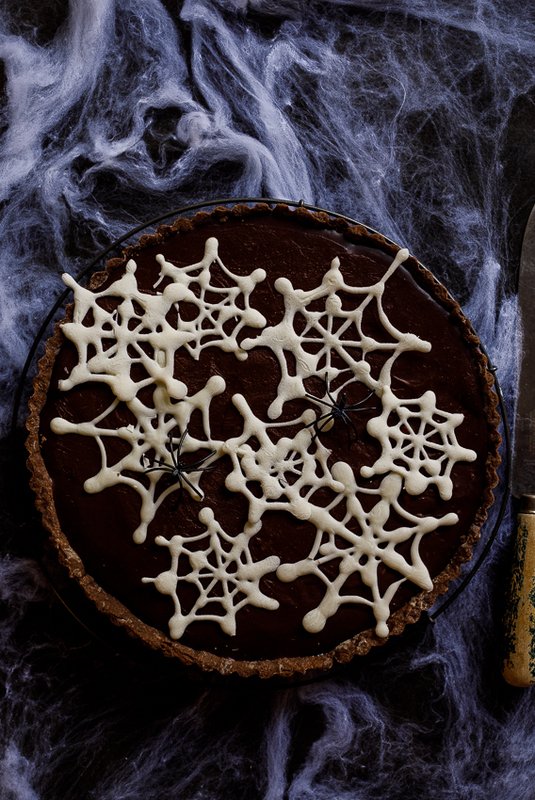 Firstly, it’s just such a dreamy recipe but I also immediately knew how I would turn this chocolate tart into something a little spooky. 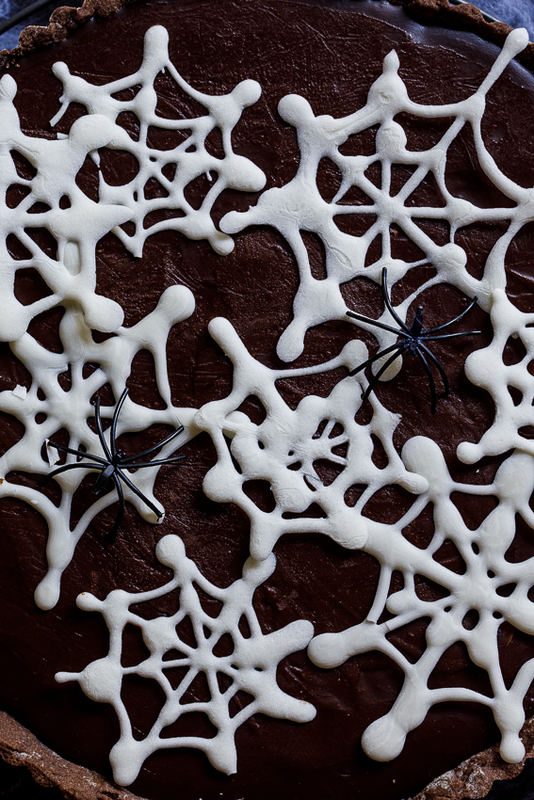 I got the kids to help me make white chocolate spiderwebs with modelling chocolate and we had such fun making them. I gave each of them a piping bag with melted white modelling chocolate (it sets a little firmer than regular white chocolate) and they went to town. You could also make one big white chocolate web on the tart instead of the small ones but I quite liked the effect of the many little ones. And then of course we had to add spiders because what’s a spiderweb without a spider? 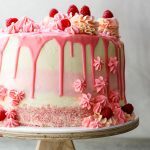 For more baking recipes and inspiration, be sure to catch the Great South African Bake-Off on BBC Lifestyle, Channel 174, Tuesday evenings at 8pm. Add butter and pulse until it looks like coarse breadcrumbs. Add egg and pulse until large crumbs form. Form disc, wrap in cling film and place in the fridge to rest for 20 mins. Roll out dough to about 3-5mm thickness and line pie tin. Push pastry into the corners and fluted edges then trim off the excess pastry. Dock the pastry with a fork then bake blind for 20min, then remove beans and bake a further 10 min. To make the salted caramel, bring the sugar and water to a boil in a saucepan and cook until golden brown in colour. Remove from the heat then add the cream carefully. Mix until smooth then mix in the butter, one cube at a time, macadamias, vanilla and salt. Pour into the baked tart shell then place in the fridge to set. To make the ganache, warm the cream to boiling point (take care not to boil the cream) then pour over the chocolate. Stir until the chocolate is completely melted then pour over the salted caramel layer and place back in the fridge to set. Pipe the white chocolate into spiderweb patterns onto parchment paper and allow to set in the fridge. Decorate the chilled and set tart with the white chocolate spiderwebs and plastic spiders. 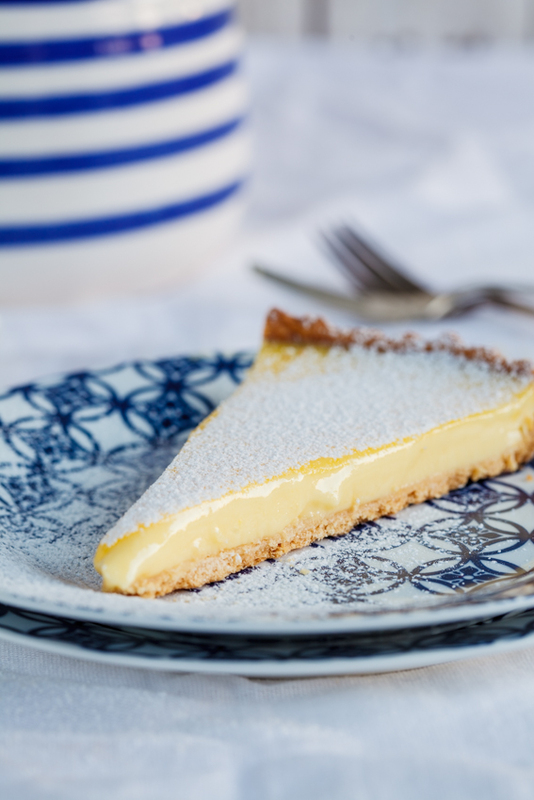 Allow time for chilling and setting of tart. Such a beautiful tart! I love the layers and your festive Halloween spin! It was such fun, and SO delicious! I am a big fan of the Great South African Bake Off. You have made a great twist to the recipe by the contestant, I really enjoyed your recipe. For interest sake, I noticed that all the ingredients, except the spider web and the change in the amount of the nuts, are exactly the same as the contestant’s recipe (http://www.bbcsouthafrica.com/recipes?recipe=chocolate-macadamia-and-salted-caramel-tart) but yet it is authored by you as Alida Ryder. Is this a common practice in the culinary world? Please send me the amount of flour and water, as it shows as question marks. Just have to try this! 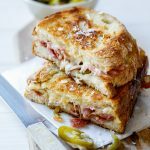 Thank you for all the other wonderful recipes on your page. I always get compliments for my cooking and it is all because of you. Hi Antoinette! My apologies, it didn’t display the 1/3 fraction symbol. I’ve updated the recipe. And thank you so much for your lovely compliment, I am so pleased you love using my recipes. Some of the amounts have ?. Could you please clarify. My apologies Carol. It changed the 1/3 symbol to a ? for some reason. I’ve updated the recipe. Totally gorgeous tart Alida! I love the festive spiderwebs on top! Sounds just decadent too! Thanks so much Mary Ann. I had such fun with it!